Falling just short of securing a place at the table once again was incumbent Councillor Evelyn Buck, who came in ninth with 3,719 votes. Many candidates came out to Town Hall to watch the election results roll in live, joined by several supporters who cheered them on. 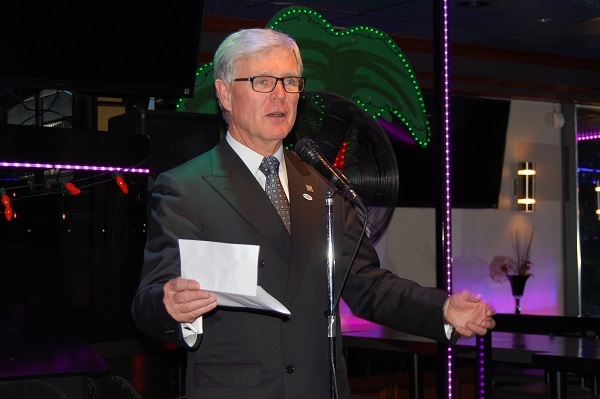 Before the results from the first three polls came in, Mayor Dawe admitted to feeling a bit of nerves. The wait proved to be worthwhile. After sealing his victory, he said the support from the community really meant a lot. “We ran a positive campaign, we focused on our record, we focused on our vision and we focused on our goal,” he said. “We focused on Aurora as the best place to live in York Region. I am completely committed to making sure that not only do we say it is the best place to live in York Region, but we’re moving up that scale in Canada. The message we portrayed throughout our campaign resonated with the residents of Aurora. They want positive, they want growth, they want to know what you are going to do, and when you are going to do it. We delivered that message. Looking at the group of Councillors he will be working with over the next four years, Mayor Dawe said focusing on revitalizing Aurora’s Downtown Core will be a top priority at the start. Development, he added, is “extremely important” in determining how to go forward, but in accordance with Official Plans and Secondary Plans. He also looks forward to working with the eight new and re-minted Councillors in getting up to speed on the tasks at hand.